Stephanie Stebich (pronounced STEE-BISH) is responsible for the nation’s premier collection of American art and major exhibition, research, publication, education and digital-media programs at the museum and its Renwick Gallery. She was named director of the Smithsonian American Art Museum in January 2017. Stebich serves on the Smithsonian’s Capital Board as well as the Smithsonian-London Strategic Advisory Board. In May 2018, she was named co-chair of the Smithsonian’s American Women’s History initiative. Before coming to Washington, D.C., Stebich had been executive director of the Tacoma Art Museum since 2005. 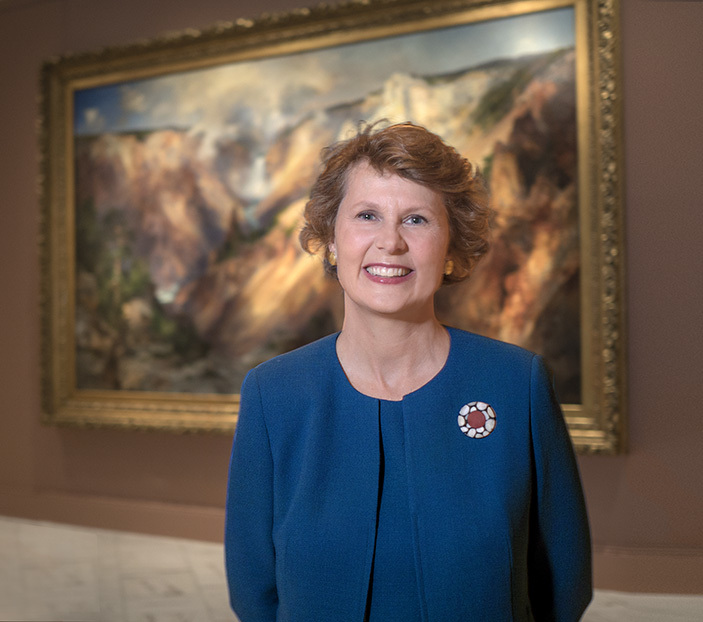 Under her leadership, the museum underwent a major renovation that doubled its exhibition space; launched a capital campaign with a goal of $17 million and raised more than $37 million; and added endowed curator, educator and fellow positions. She oversaw the development and implementation of the museum’s strategic plan, as well as a 10-year collecting strategy. At Tacoma, Stebich championed the presentation of many groundbreaking exhibitions and secured major collection gifts, including the Haub Family Collection of Western American Art, 300 masterworks from the 1790s to the present by Charles Bird King, Thomas Moran, Frederick Remington, Georgia O’Keeffe and others; and the Rebecca and Jack Benaroya Collection, 225 works of American studio glass featuring Pilchuck School artists such as Dale Chihuly, Ginny Ruffner and Therman Statom as well as artworks by Northwest artists such as Morris Graves and Deborah Butterfield. Stebich was assistant director of the Minneapolis Institute of Arts from 2001 to 2004 and assistant director at the Cleveland Museum of Art from 1995 to 2001. She was previously a trustee of the Association of Art Museum Directors from 2010 to 2012, where she led and implemented its diversity initiative as chair of the membership committee. Stebich earned a bachelor’s degree in art history from Columbia University and a master’s degree with a concentration in modern art from the Institute of Fine Arts at New York University. She has a certificate in nonprofit management from Case Western Reserve University and is a graduate of the Getty Leadership Institute in Los Angeles. She was a fellow at the Guggenheim Museum and has studied at the University College London. She is fluent in German and French.